If you’ve escaped getting the dreaded sore throat that often accompanies an upper-respiratory infection, consider yourself lucky. But just know you’re not out of the woods yet. This year’s cold and flu season is brutal. People are missing work and school at an alarmingly high rate and drugstore shelves are being cleared of any over-the-counter remedies that might put a dent in symptoms. Plus, we’re only halfway through the winter. Unfortunately, there’s no way to know for sure how much longer we’re going to get hit with this horrible stuff or how much worse it’s going to get. In the meantime, you might want to make sure you’re stocked up on all the essentials you’ll need in case you do find yourself waking up to a scratchy, itchy, burning throat. SheKnows talked to a few experts about some of the tried-and-true ways to tame that pain. Here’s what they had to say. If you’re experiencing pain that worsens when swallowing, a painful or scratchy feeling in your throat and sore/swollen glands in your neck, then you might want to start treating it. Dr. Christopher Calapai says a sore throat is one of the most common medical problems people have. There can be a variety of causes including bacteria, viruses and issues related to nerve problems coming from the neck to the throat. They can also be from the flu or even just mucus from your nose. During this time of year, sore throats can be a nuisance for many. 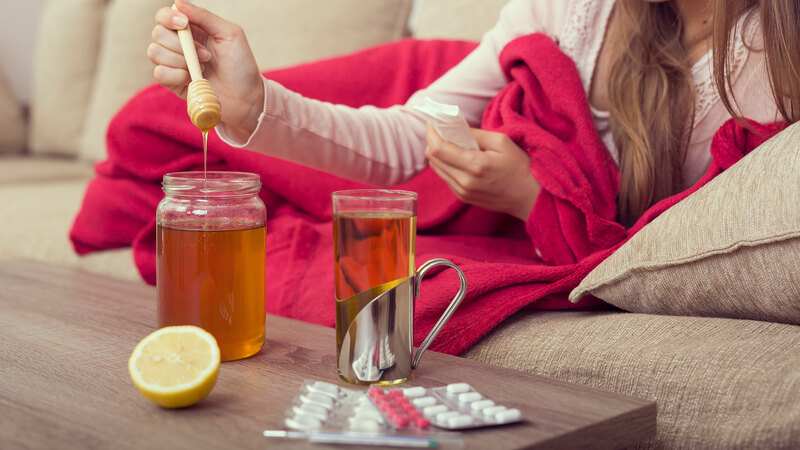 However, Dr. Peter F. Bidey, a family physician in Philadelphia, says many over-the-counter medications and home remedies can help you alleviate some of your symptoms. Here are a few of his favorite methods to get rid of a sore throat. Bidey suggests throat lozenges, honey, tea and lots of liquids to help keep your throat moist and hopefully decrease the pain. Make sure the liquids are either cool or warm, but try to avoid very hot liquids because they can make the pain worse. “Over-the-counter medicines like acetaminophen [Tylenol] and NSAIDs like Ibuprofen can help decrease inflammation and pain,” explains Bidey. Throat sprays can also decrease the pain in the short term as well. Chronic sore throats can often come from postnasal drip and allergies. Since mucus from your nose can be very irritating to your throat, Bidey recommends over-the-counter decongestants, nasal sprays and even a cool-mist humidifier to help with some of these symptoms. However, if you suffer from high blood pressure, Bidey says you need to clear any decongestant use with your primary care practitioner because many can increase your blood pressure. Whether it’s saline nasal spray or gargling with salt water, saline does not harm the body topically. That’s why Bidey recommends this option for smaller children and pregnant women, who often cannot take some of the other over-the-counter medications. Most sore throats will resolve within a week. However, if the pain and irritation persists or is associated with fever, chills, extreme difficulty swallowing or rash, Bidey recommends making an appointment with your primary care physician.